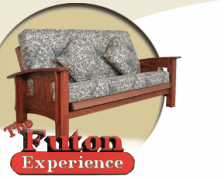 Welcome the to The Futon Experience, a family owned and operated business serving the greater Lehigh Valley Area and Pocono Mountains since 1998. Specializing in futon frames, futon mattresses, futon covers and futon accessories. Our extensive knowledge of futon products allows us to bring you the finest and most durable products available in the market today. Visit our showroom to experience our products in person or browse our website. Call us with any questions you might have.